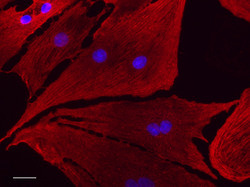 Cardiac muscle consists of interlacing bundles of cardiomyocytes, the nucleus of which are stained blue. In a recent publication, Hossein Ardehali, MD, PhD, showed that heart damage from the anti-cancer drug doxorubicin is caused because it promotes an accumulation of iron inside mitochondria. Northwestern Medicine scientists have discovered the role iron plays in weakening a person’s heart following treatment with the common chemotherapy drug doxorubicin (DOX). Hossein Ardehali, MD, PhD, associate professor in Medicine-Cardiology and Molecular Pharmacology and Biological Chemistry, found that cardiomyopathy, a prevalent side effect of DOX, is dependent on the accumulation of iron inside the mitochondria of cells. The findings were recently published in the Journal of Clinical Investigation. Used in chemotherapy, doxorubicin is credited as a “wonder drug” for greatly reducing pediatric cancer deaths throughout the 1990s. Although heart damage remains the most serious side effect, DOX is commonly used in the treatment of a wide range of cancers, including those of the breasts, lungs and ovaries. The Ardehali lab is working to produce a drug to treat doxorubicin-induced cardiomyopathy by reducing iron inside mitochondria. Pictured from left are Arineh Khechaduri; Rosie Wu, MD, PhD; Kannan Mutharasan, MD; Hossein Ardehali, MD, PhD; Marina Bayeva, PhD, Mohsen Ghanefar, MD. The lab took multiple approaches to finding that answer. Using an animal model, scientists were able to demonstrate a reversal of doxorubicin-induced cardiomyopathy by removing iron from the mitochondria. The lab also demonstrated that a drug used to treat DOX-induced heart weakness works by reducing mitochondrial iron, something that hadn’t previously been shown. Combined with a recent paper suggesting a specific protein also plays a role in heart damage, Dr. Ardehali believes scientists have now identified two independent pathways involved. Moving forward, the lab will work to produce a drug that would specifically reduce mitochondrial iron to treat doxorubicin-induced cardiomyopathy. Dr. Ardehali’s group has already identified a number of potential compounds and is working in collaboration with the Center for Molecular Innovation and Drug Discovery (CMIDD) to begin preclinical trials. The project was funded by National Institutes of Health grants HL107448, HL087149, HL104181, and HL108795.